This popular and long-running 1940s radio series expertly blended situation comedy and family-oriented drama. 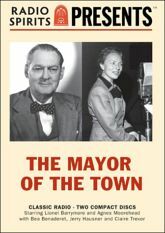 It was also an ideal vehicle for Lionel Barrymore, playing the small-town mayor of Springdale whose cranky, curmudgeonly exterior belied a heart of gold. Co-starring as his housekeeper Marilly was Agnes Moorehead, a woman more than capable of matching his irascibility. Also appearing are Bea Benaderet, Jerry Hausner, Claire Trevor and Veola Vonn.